The U.S. Air Force’s MQ-9 Reaper drone quietly started flights from Miroslawiec Air Base, Poland, in May, but the service isn’t saying exactly why. 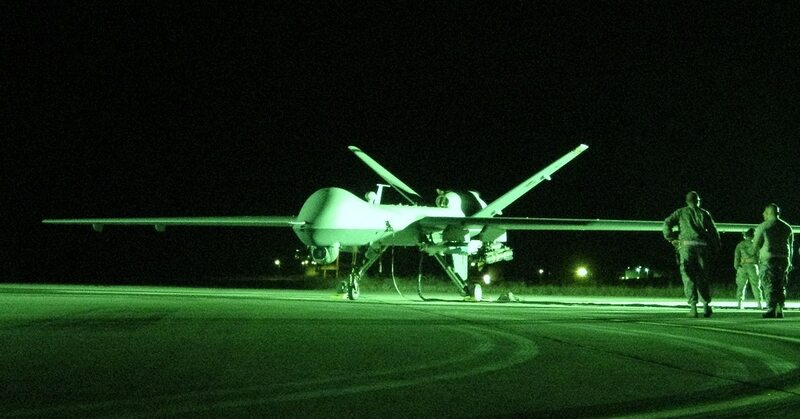 In response to a query, U.S. Air Forces in Europe would only say that the Reapers will be unarmed and only used for intelligence, surveillance and reconnaissance. “Our priority for this mission is to maintain ready and postured forces on land, in the air, and at sea,” Auburn Davis, a civilian U.S. Air Forces in Europe official, told Air Force Times. A retired U.S. Air Force pilot, who flew both the MQ-1 Predator and MQ-9 Reaper, told Air Force Times that the drones would be difficult to use in conflict zones such as eastern Ukraine — where Russian-backed separatists are engaged in a low-kinetic war against the Ukrainian government. “Drones may be vulnerable to Russian-supplied [anti-aircraft artillery] and [surface-to-air missiles], so it may not be prudent to commit them against the rebels or to escalate an already tense situation,” the Reaper pilot said. “We currently operate in arenas where we have total air supremacy. That’s something we would not have in eastern Ukraine,” he added. Instead, the Reaper pilot said drones would serve as a deterrent in support of NATO allies, with the flexibility of future employment if the situation in Ukraine deteriorated. With the retirement of MQ-1 Predators this month, MQ-9 Reapers are executing deliberate strikes, providing armed overwatch or close-air support, and flexing to ISR taskings — all in a single mission. Citing operational security concerns, Davis would not divulge the exact number of U.S. aircraft or personnel that would be deployed to Poland for this new Reaper mission. Additionally, Davis would not say whether those personnel would be only conducting launch and recovery missions from Poland, or whether they would be piloting the drones from the air base there as well. Drone missions are sometimes piloted by aircrew who remain stateside at Nellis Air Force Base, Nevada, or Davis-Montham Air Force Base, Arizona, for instance. The take-off and landing of those drones is conducted by launch and recovery crews who deploy to the drone’s location. Poland’s government is cooperating with the new Reaper mission, and given the country’s desire to host a U.S. armored division in the near future, likely lobbied in some way for it as well. Although the Reapers out of Poland will be unarmed, the drones often fly with a combination of AGM-114 Hellfire missiles, GBU-12 Paveway IIs and GBU-38 joint direct attack munitions, or JDAMs. The Reaper is a multi-mission drone, with a cruising speed of roughly 200 knots and a range of approximately 1,000 nautical miles. The drone can maintain a ceiling of up to 50,000 feet, and is considered a medium-altitude remotely piloted aircraft. Reapers have a significant loiter time and wide range of sensors that make them ideal for intelligence collection against “high-value, fleeting, and time-sensitive targets,” according to the Air Force.